Amazon CEO Jeff Bezos’ net worth exceeds $100 billion – while around 350,000 US company workers struggle to survive on poverty wages, along with enduring deplorable working conditions for maximum productivity at company fulfillment centers. Lots of injuries occur, he explained. Many go unreported. People work injured, needing the pay, unable to take uncompensated time off. When someone is injured, they bear the burden to prove it, often not easy because the company shuns payouts. Workers are on their feet throughout their shifts, permitted one 15-minute break if work under eight hours daily. If longer, they get an optional unpaid 30-minute meal break. Failure to meet quotas multiple times risks termination. Workers feel exploited. They’re constantly monitored, including when getting a drink of water or going to the bathroom. Talking is discouraged, workers told they have to be more productive. Benefits are meager. Costello said he gets none because he can’t afford to pay his portion of the cost. Many workers have no benefits. Others with them aren’t fully covered. Many need other jobs and food stamps to survive. Turnover is high. Many workers quit or get fired for not making quotas. Some are let go before a pay raise, then rehired at less compensation. Amazon is not a safe company to work for, he stressed, nor free from racial discrimination. No company locations are unionized, management adamant against it. The company is like Walmart, exploiting workers for maximum productivity and company profits, way under-compensating them. Reportedly, workers paid over $15 an hour will get an added $1 hourly increase. Hold the cheers. Increased hourly pay for all company workers comes at the expense of lost bonuses and stock awards – resulting in less compensation overall, greater company profits, why Bezos is “excited” about the change. Sanders like others cheering the move ignored Amazon’s plan to take more back from workers than it’s giving them, decreasing their overall compensation. According to Yahoo! 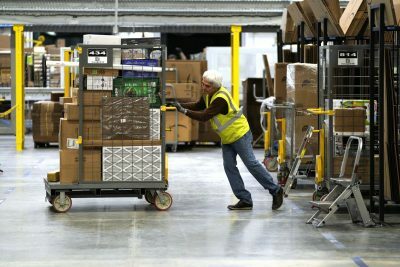 Finance, the typical Amazon worker earned $1,800 to $3,000 annually through its variable compensation program. Bonus earnings could double during peak months. An anonymous worker said an additional $1 in hourly pay amounts to $2,080. It comes at the expense of “a few thousand dollars more from the incentive programs” the company eliminated. Last year, the media Amazon worker earned $28,446 or roughly $13.68 an hour. An extra $1.32 per hour increases their median annual income to around $30,000. For a family of four in most US cities, it’s poverty-level income, federal guidelines indicating otherwise way unrealistic. For decades in America, worker pay lagged inflation the way it should be calculated, not how it is to way understate reality. People who eat, drive cars, pay rent or high mortgage obligations, have medical expenses, pay college tuition and fees, as well as heat and/or air-condition residences know more about inflation than mainstream talking head economists. Working class Americans are overworked, underpaid and exploited while corporate giants and high-net-worth households never had things better. Inequality in the country continues growing no matter which right wing of duopoly governance is in power. Featured image is from The Verge.